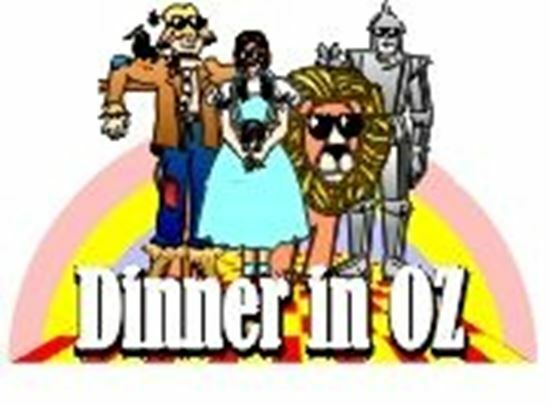 Cast: Adapted from the novel, "The Wizard of Oz,"
Trapped in Kansas and longing for a mall, Dorothy and Toto are suddenly whirled off stage, right into the audience, where a yellow brick road weaves in and out of the tables and munchkins are serving food. In this outrageous version of L. Frank Baum's lovable book, the Tin Man has frozen in front of a computer, and the Cowardly Lion stands on a guest's chair to escape a mouse. As the plot unfolds, we eventually meet the "great" Wizard of Oz, who is really a timid man, and a witch who speaks in rhymes and commands a cabal of talking creatures. A few surprise guests also attend this humorous and heartwarming adaptation, which promises to involve, entertain, and delight any audience. As Dorothy clicks her silver shoes and happily returns home, all will be smiling and laughing as they scrape their dessert dishes clean.